I spent some time traveling to and from Steamboat Springs, Colorado this past week and was startled by the effects of the mountain pine beetle. 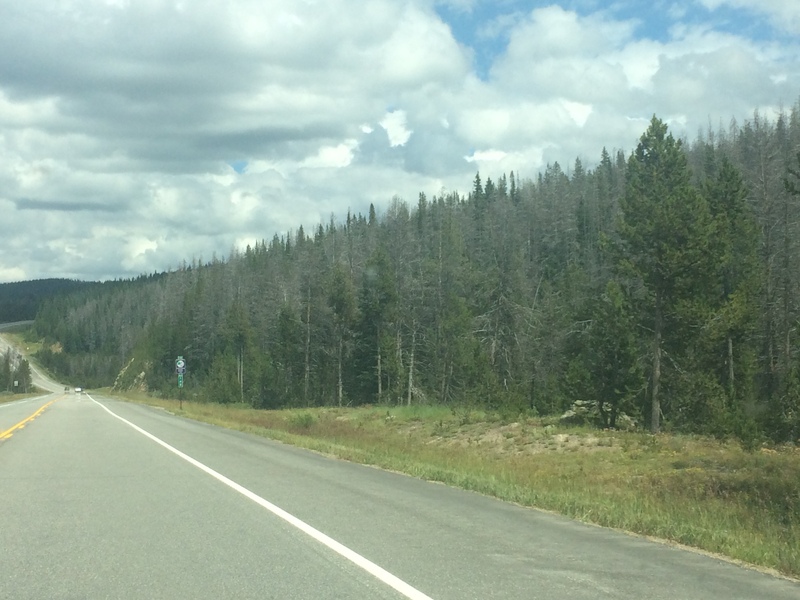 There were huge swaths of forests along U.S. Highway 40 just south of Steamboat that had groves of dead pine trees. Because the trees have been dead for several years now, they stand a ghostly gray set against the still living trees of aspen and fir. These resulting stands of “ghost forests” are what’s left of a deadly epidemic of mountain pine beetle that destroyed millions of acres of forest in western North America. Mountain pine beetle is a native insect that has been around as long as European settlers have been in the area. Outbreaks of mountain pine beetle usually occur every 30 years and as you might guess, they target pine trees. The little bug that are about the size of a grain of rice, mate and lay eggs inside the bark of pine trees. They send out pheromones (or as I explained to the kids beetle perfume) to attract other beetles to the host tree so they can lay eggs as well. Those eggs hatch, turn in to larvae during the winter, and turn to beetles in spring, only to fly to other trees and start the whole cycle over again. Pine beetles kill the trees by carrying a deadly blue stain fungi in their bodies and leaving it in the growing part of the tree. This fungi essentially strangles the tree, depriving it of water and food. The tree initially tries to fight off the beetle infestation by using its sap to pitch the beetles out. You can tell a tree that’s become infested by the “pitch tubes” of sap that are all over the trunk of the tree. But when you get hundreds of beetles infesting a tree, it’s difficult to fend them off. The beetles are smart, usually targeting more mature trees that are weakened from drought or other disease. Usually the younger trees of six inches or less in diameter are left alone. From the late 1990s to around 2013, an outbreak of epidemic proportions broke out through the Western U.S. and Canada. More mature lodgepole pines were killed than any other tree. In Rocky Mountain National Park, they estimate 47 percent of mature lodgepole pines were killed. The outbreak was particularly lethal on the west side of the Continental Divide. As you drive through the Frisco area, or the Vail Valley, the hillsides are covered in thousands of dead pine trees. Most researchers believe this latest epidemic is linked to changing climate, that the warmer winters in the west are not killing off as many eggs, and the longer growing season is allowing two life cycles to hatch during each season instead of the usual one. Forestry personnel estimate almost 3 million acres of forest in Colorado was affected and several million more in other western states, including 33 million acres in British Columbia alone. Initially when the trees die, the first season they are considered “red dead.” The needles go brown and red and as you can imagine are very flammable. But surprisingly, when they go to the gray, standing snags, they are no more flammable than other living trees around them. They are, however, very unstable and can easily be uprooted by windy storms combined with wet soils. For this reason, many agencies like the National Park Service and U.S. Forest Service have cut down beetle kill trees along roads, picnic areas, and heavily used trails for safety reasons. It can be startling and somewhat disturbing to gaze upon all the dead trees. The whole thing seems somewhat tragic and you realize these forests have been forever altered, and will never look the way did previously. I also believe that it affects us older adults more, because we inherently compare it to how we saw the forest before. But in talking to kids about it, they see it differently. They see it through children’s eyes, realizing that the forest isn’t gone, but changed, and perhaps changed in a good way. That the death of one tree allows new trees and flowers to grow. In fact, ecologists believe that our lodgepole pine forests were too dense and unhealthy. That we will now see more aspens, firs and spruces growing in their place, and perhaps the end result will be a more healthy and diverse forest for the future.